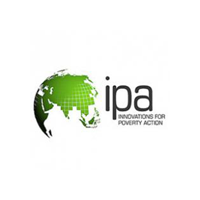 About Innovations for Poverty Action: Innovations for Poverty Action (IPA) is an international non-profit research organization dedicated to discovering and promoting effective solutions to global poverty problems. IPA works in partnership with development partners and academic researchers to create and evaluate approaches potential solutions to poverty problems using randomized evaluations in the fields of health, education, microfinance, governance and agriculture. We also mobilize and support these decision makers to use these solutions to build better programs and policies at scale. About the Project: Financing the In-Between Sector: Designing and Evaluating Targeted Lending in Tanzania is a project designed to evaluate the potential for targeting loan products to high-potential micro and small enterprises. Roughly 250 firms in Arusha, Kilimanjaro, Mbeya and Singida regions who have demonstrated the ability to repay small loans will be surveyed and then offered a chance to apply for an improved loan product from one of Tanzania’s leading commercial banks. The purpose of the data collection is to identify characteristics associated with credit demand, loan approvals and loan repayment and will consist of a detailed survey on business performance, management practices and growth aspirations. • Experience conducting surveys a plus. TO APPLY: Email CV to j.silver@cgiar.org with subject line ‘Field Officer- Financing the In-Between Sector.’ Do not include certificates or other documents. DISCLAIMER: The above statements are intended to describe the general nature and level of the work being performed by the Field Officer – Financing the In-Between Sector. The statements are not intended to be an exhaustive list of all possible duties, tasks, and responsibilities. Management reserves the right to amend and change responsibilities to meet organizational needs as necessary. Please note that IPA will never request any form of payment from an applicant.